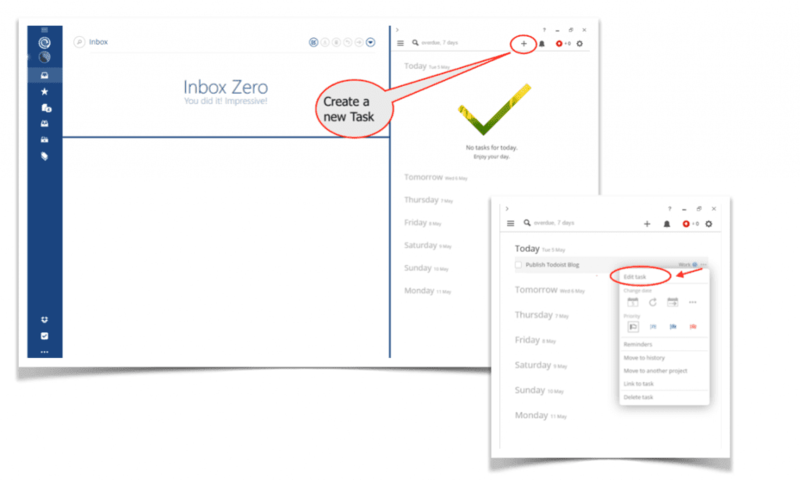 With Mailbird 2.0 we launched our new Todoist integration. With it still being at the early stages of the integration, you are able to work on your Todoist To-Do list right from within your Mailbird, side by side with your Email. Together with the great support of the Todoist Team, we will be working on a deeper integration to add more awesome features, such as Drag&Drop, soon. Simply activate the Todoist App in your Mailbird AppStore. The Todoist icon will then appear in your left menu panel and in your Mailbird sidebar (top right corner). Once you have created your Todoist account, you can easily set tasks and create your To-Do List the way for you to be most productive. Set tasks can also be easily edited. There are some great additional options and features for all Premium Todoist users. “Add Task via Email” is one of them. This feature enables you to send and even create tasks via Email and added to your To-Do List without even accessing Todoist. Click on the little round gear icon at the top-right corner of a project, and you’ll see a unique Email address for that project. You can now use this Email address to send a task to your project. 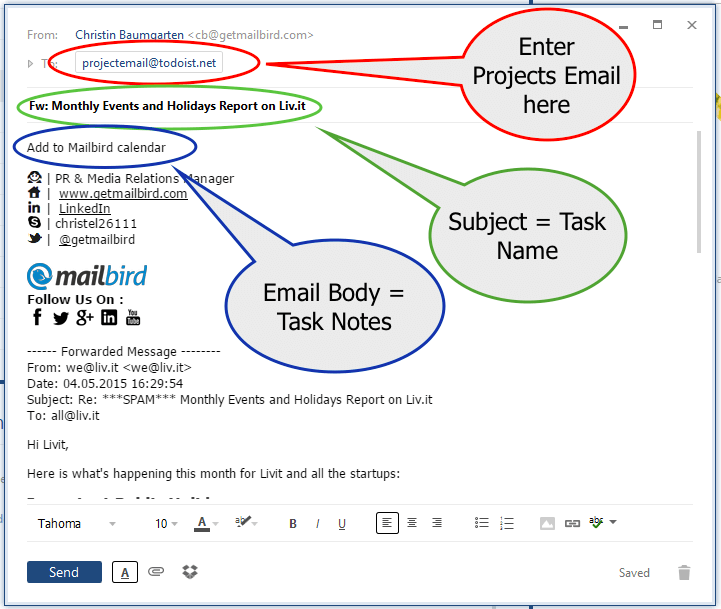 The subject of the Email will become the task name and the Email content will be notes for the task. You can also create a task by sending an Email to the chosen project. You need to include the name, date and label in the subject line and the task will be created. For more awesome features and Tips & Tricks on how to use them, have a look at the Todoist blog here. Are you ready to take your productivity to a new level? Activate your Todoist App now and start creating the best To-Do list ever. 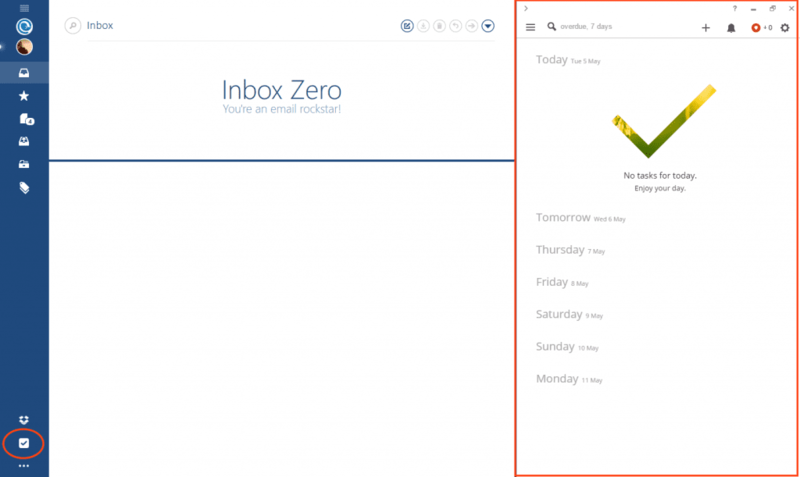 7 thoughts on "Mailbird loves Todoist"
Are there any plans to make this drag and drop like the Moo.do integration? 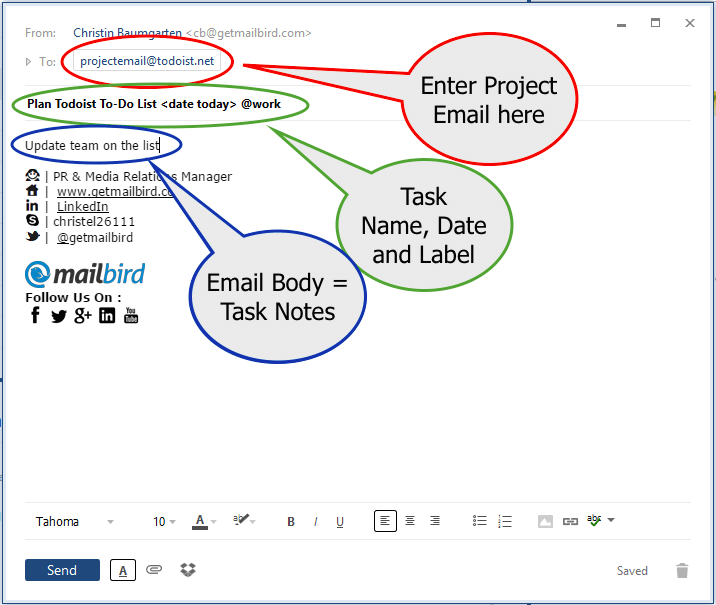 Installed Mailbird 2.5.27.0 with free license (1 days remaining Pro trial). 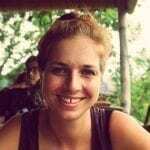 On Todoist add-on, clicking “Log in with Google Account” makes Mailbird crash. Is there any way to convert an email into todoist task with two-way link? Please don’t suggest to forward email to todoist as this is not what I want.